ActiveWave technology ensures an arc under 80dbA. FRONIUS has released the three-phase MagicWave 5000 digital tungsten inert gas (TIG) system. Its volume and weight are 50% less than that of its predecessor. It uses ActiveWave noise minimisation technology and a LocalNet remote control interface. The Job version provides the high-end user with an additional set of functions. 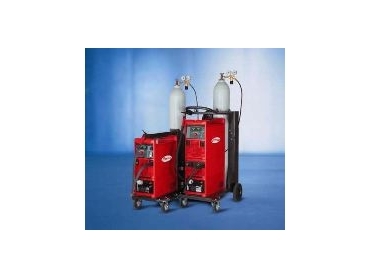 The MagicWave 4000/5000 systems for ac/dc welding and the TransTig 4000/5000 are suitable for both manual and automatic operation and cold-wire welding. The actual performance figures of the MagicWave 5000 are 500A at a 40% duty cycle and 40°C ambient temperature, given an input voltage range of ±15% at 3 x 400V. The actual values are regulated by a microprocessor and digital signal processor. This guarantees welding results which can be reproduced exactly. Like its single-phase companions, one of the features of the three-phase MagicWave is ActiveWave technology, which ensures an arc under 80dbA. Ten MagicWave welding systems generate no more noise than a single inverter power source with rectangular waveform. In addition to the significantly lower risk to health, it also allows the user to weld by ear. Reversed polarity ignition stabilises and significantly shortens the ignition process. This is especially useful for mechanised and automated dc applications. The TAC tacking function makes life easier for the user. A pulsed arc causes the liquid weld pool to move, which in turn accelerates weld formation. This saves a lot of time when compared to the conventional tacking method. The automatic capshaping function can help to reduce work times even further. It lasts only one second, as opposed to the usual 90 seconds. Fronius’s modular system also offers potential savings. Peripherals and options from the extensive product range can be combined and replaced as required.